Sartori, a fourth-generation family-owned company, has proudly produced internationally award-winning artisan cheese for customers worldwide since 1939. Rooted in Wisconsin, Sartori's emphasis on a high-quality and handcrafted approach to cheesemaking is a timeless family tradition. 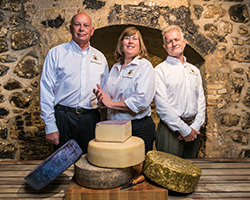 Sartori's Master Cheesemakers bring decades of experience and artistry to every handcrafted wheel of Sartori Cheese. Their hard work, combined with the talents of our Team Members and dedication of our Wisconsin Family Farms, have led to Sartori Cheese winning more than 400 awards on the national and international level. Sartori's finest Parmesan is nutty and fruity with hints of lightly roasted caramel. It is also America's most highly decorated Parmesan, thanks to the skill of Sartori's cheesemakers and the good taste of judges around the world. Perfect for grating over pastas or pairing on cheeseboards. A Sartori-family original, this rich, creamy cheese with its nutty, fruity flavor is a celebrated gold-medal winner. Inspired by traditional, Italian farmstead cheese, BellaVitano Gold begins in the mouth like a premium Parmesan and finishes in award-winning style with hints of melted butter. This is where Sartori's artisan cheesemaking first began to shine. By wedding this rich, creamy cheese to the berry and plum notes of Merlot, Sartori has created a marriage of flavors destined to make your taste buds say, "I do." Pair it with some toasted walnuts, thin slices of prosciutto, and semisweet chocolates for dessert, and the honeymoon never has to end. As a delicious treat for your breakfast or dessert, Sartori hand-rubs freshly roasted espresso into sweet, sugary BellaVitano wheels aged to creamy perfection. The result is a rich cheese that can be paired with savory or sweet. Rosemary provides the perfect savory high note for this rich, nutty and fruity taste sensation. A gold-medal winner of the World Championship Cheese Contest, this extraordinary delight wears its laurels as lightly as the perfect balance of hand-rubbed rosemary and Italian olive oil.